Condenser Air Inleakage Inspections are usually conducted with the unit on-line. Routine inspections to understand where potential failures will occur and to maintain an efficiently operating condenser. Emergency inspections because of a catastrophic failure or because the air inleakage has exceeded the air removal systems’ capabilities and the unit is unable to maintain maximum efficiency. How long does a Condenser Air Inleakage inspection take? 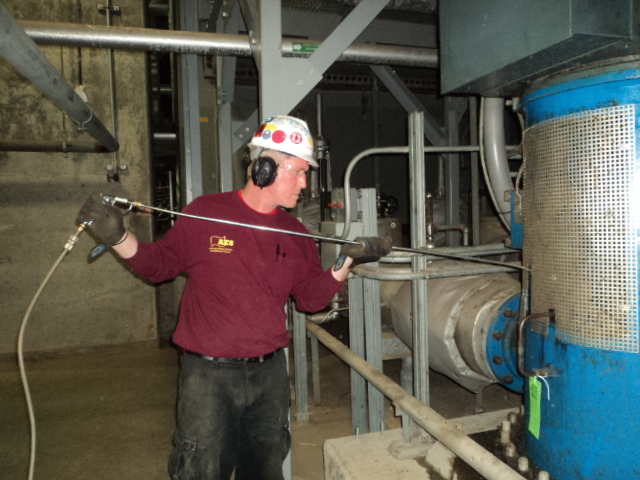 American Efficiency Services’ technique and experience can identify the sources of leakage within the vacuum boundary of the turbine and/or condenser system within one to three 8 – 12 hour shifts. The length of the inspection is dependent upon the unit size, the amount of leaks identified during the inspection, the response and/or clear-out time of the indications, and the station’s desire to repair and re-inspect any of the leaks identified. Why do we use Helium? Helium is applied to the various components within the vacuum boundary of a Turbine and/or Condenser system. A leaking component will allow the helium to enter the steam space and from there, the helium will be removed by the unit’s air removal system. AES will have an inspector located at the discharge of the air removal system with a mass spectrometer sensitive to helium. As the helium is ejected from the system, the mass spectrometer registers an indication. The leak will be recorded and at the completion of the inspection, all leaks will be discussed with plant personnel. The discussion will include the severity of the leak, location of the leak, and potential repair options. Why inspect to minimize air inleaks now? Surface condensers are designed to be a vacuum tight system with cooling water flowing through tubes. The cold tube surface condenses the steam creating a reduction in volume inside the condenser, which produces a vacuum. Air and non-condensables (air inleakage) that are allowed to enter the steam space from outside the unit can cause a reduction in vacuum. Condenser air removal systems are designed to remove a certain amount of air inleakage. As the design limitations of the air removal system are approached, the efficiency of the unit decreases. In order for the Utility to maximize the potential of the unit, condenser air inleakage must be minimized. As condenser air inleakage increases, the backpressure (loss of vacuum) increases. The rate at which the backpressure increases due to air inleakage is dependent on the effectiveness of the air removal system. The air removal system should be able to control small amounts of air inleakage before noticeable effects are observed. The most expensive effect is the loss of electrical output from the generator. Other factors can contribute to an increase in backpressure such as fouled condenser tubes that minimize the amount of heat transfer. An air inleakage inspection is an excellent first option for solving a high backpressure problem, since the inspections are conducted on-line. A reduction in power or complete unit shutdown must occur to clean the condenser tubes. Dissolved Oxygen is another byproduct of excessive air inleakage. Air that is allowed to enter the steam space and is unable to be removed has the potential of being entrained in the condensate. When the air is allowed to be passed through the feed water system to the boiler, corrosive conditions will exist throughout the entire path of the system. If the dissolved oxygen levels remain high for a long period of time, the affected components’ life will decrease. This results in longer outages and lost revenue. Most condenser standards have been developed by research organizations and individual stations. These standards vary from station to station depending on their situation. The most common standard used for condenser air inleakage is one cubic foot per minute (CFM) for every 100 megawatts of generator capability. Most stations have adopted a standard of between 1 and 2 CFM per 100 megawatts. Other stations rely on their history of backpressure and dissolved oxygen. They become accustomed to the “normal” readings and allow this to dictate how they manage their systems. A quality management program is the best way to determine how effective a condenser can be within a system.